For most of us, buying a home is the most expensive purchase we’ll ever make. We want to make sure that we do it right—from picking the right neighborhood to getting the best possible price on our home. So, when is the cheapest time of year to buy a home? Is there such a thing? We did a little digging to find out. Lucky for us, the U.S. Census Bureau collects data on home sales for new construction, single-family homes. Using data from the past 20 years, we analyzed prices on these new construction single-family homes. According to this data, buyers can expect to save about 3.13 percent on their home purchase in January. This supports the conventional wisdom that buying a home in January and February can maximize your savings. The thinking goes that you can get a better deal in January or February because not as many people want to move during colder months. That being said, while there won’t be as much competition, you’ll see more limited supply on the market. According to the U.S. Census Bureau data, November and December are the months when you might pay a premium of 0.86 percent and 1.67 percent, respectively. So, that solves it: January is the best month to buy a home. Well, it’s not that easy. While data can often simplify complicated questions, it can also leave things out. The benefit of the U.S. Census records is that they’re expansive. They’ve been collecting this data since the 1960s, so it’s helpful for a broad picture look at the market. But this data is limited to new construction because the Census Bureau doesn’t collect information on existing homes. It’s also limited to single-family homes. It doesn’t account for condos or townhomes, giving it a decidedly suburban and rural slant. While it’s helpful to use national data for scale, the truth is that when you’re looking to buy a home, you’re probably not setting your search parameters at “United States.” Other life factors like jobs, kids, and the neighborhood vibe you’re looking for come into play. We wanted to see how home sale trends in different neighborhoods compared to the national average. To do this, we picked the three neighborhoods in each city with the largest number of homes on the market. We took the monthly median sale price over a three year period and compared it to the annualized median sale price for that neighborhood to figure out which were the cheapest months to buy a home in each neighborhood. Here’s what we found. The neighborhoods we looked at in Chicago were Lakeview, Lincoln Park, and River North. 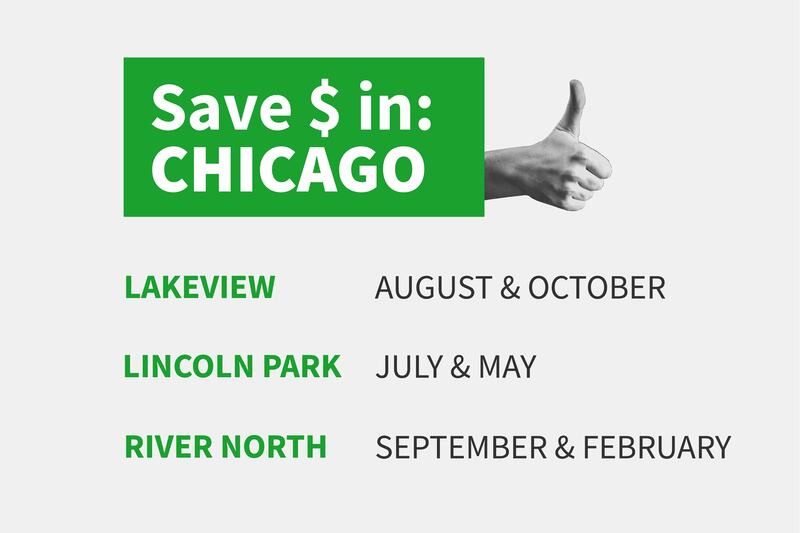 Lakeview buyers can expect to find the biggest savings in August (7.74 percent) and October (6.27 percent). In March, you’ll see a premium of 4.49 percent, and in January, the premium is 3.80 percent. Buy in July, and you can save 7.56 percent. Buy in May, and you’ll benefit from a 4.04 percent average price drop. You’ll want to close those deals before the end of summer though. In Lincoln Park, September brings with it a 5.73 percent premium, and in January, the premium is 4.23 percent. If you close on your new place in September, you can expect to save 7.47 percent. 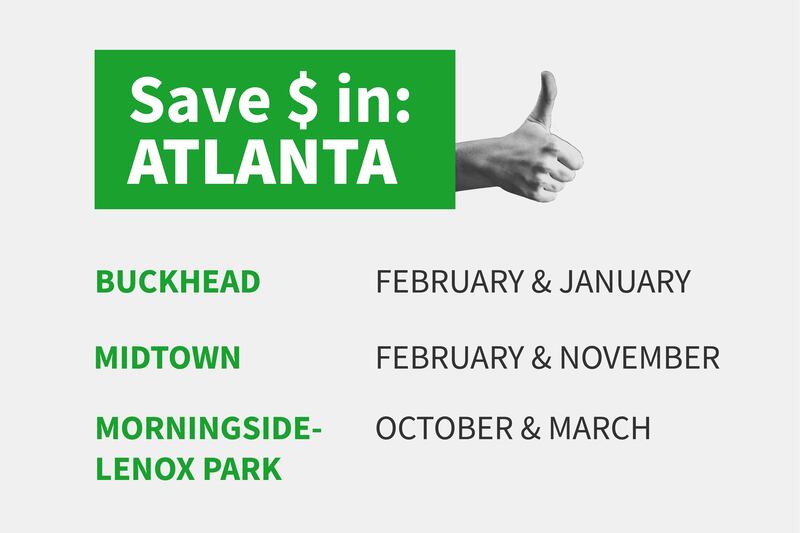 In February, you’ll save 5.35 percent. In December, you’ll be coughing up an extra 7.60 percent, and in July, that premium will be 6.34 percent. In Buckhead, timing is everything. Buying a home in February will save you a staggering 23.61 percent. January comes in with an average savings of 8.24 percent. On the other hand, the premium is 14.35 percent in June, followed closely by December, when you’ll see premiums of 14.13 percent. February reigns supreme in Midtown too. February buyers can expect to save 7.68 percent. November is a close second with savings at 6.33 percent. In October, Midtown real estate carries an average premium of 6.17 percent, and July has a 5.44 percent premium on pricing. In October, you’ll see prices at an average discount of 15.11 percent. March comes in second place for real estate savings with a 6.40 percent average savings. Be aware that you’ll see a whopping 23.69 percent premium in July, and April has a 4.59 percent premium. In Philadelphia, we considered housing prices and trends in Point Breeze, Kensington, and Rittenhouse Square. In the neighborhood of Point Breeze, you can find the deepest discounts in October, when you’ll save an average of 13.63 percent on your home. January gets the silver medal for saving 7.57 percent. May, along with its flowers, brings premiums of 12.78 percent, and June is close behind with 8.76 percent premiums. Your Kensington resolution can be “new year, new digs” because you’ll save 15.87 percent in January. It’s impressive even compared to March when you can save 8.85 percent. On the flip side, you’ll have an 11.83 percent premium in September, and in December, prices are up by 8.32 percent. 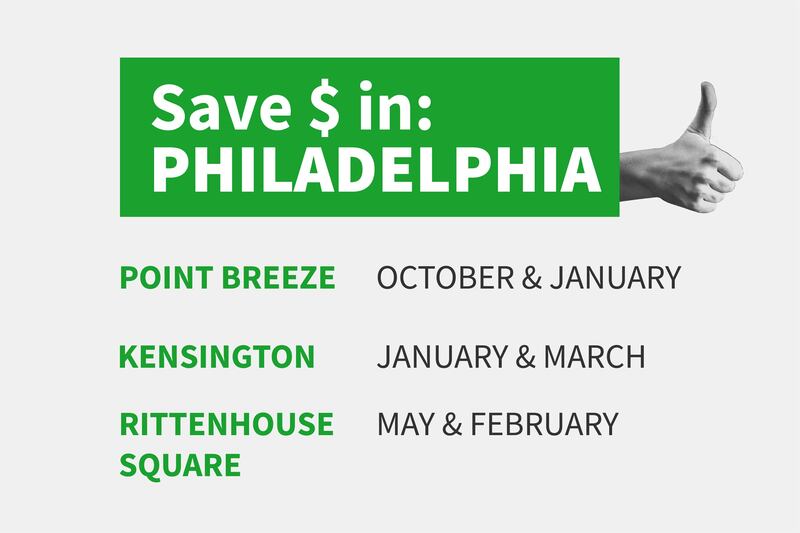 Spring can save you money in Rittenhouse Square—discounts average at 17.85 percent in May, followed by 12.00 percent savings in February. The most expensive month to buy is January with a premium of 12.58 percent, and December is almost equal with premiums of 12.00 percent. The L.A. neighborhoods we looked at are Hollywood Hills West, Downtown LA, and Encino. Fall is a good time to make a move on your dream home in Hollywood Hills West. You’ll find discounts at their deepest in October (11.76 percent), but September isn’t far behind (8.96 percent). The most expensive time to buy a home in this neighborhood is February, when you’ll pay a premium of 11.83 percent. The second most expensive month is July, when you’ll face a premium of 8.60 percent. 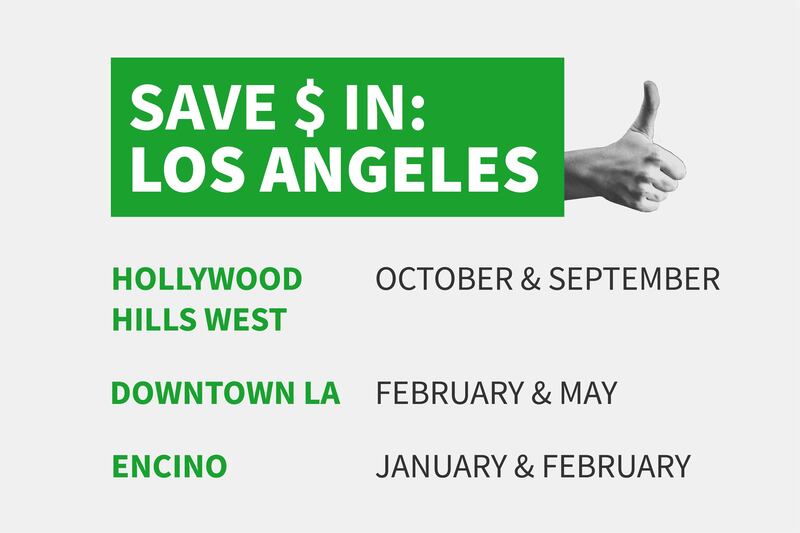 In Downtown LA, February brings discounts of 8.03 percent. May is close behind with discounts averaging 7.99 percent. However, premiums average 8.08 percent in January, and September brings steep prices too, with premiums of 4.95 percent. January brings the biggest savings (17.08 percent), followed by February (14.04 percent). The most expensive month comes right before. December carries an average premium of 11.42 percent. June prices are the second highest with premiums of 9.24 percent. Once we looked at pricing on a neighborhood level, we saw wild variation not just from the national data but from neighborhood to neighborhood. The month with the most savings in one neighborhood might be the most expensive month to buy in the neighborhood next to it. If maximizing your savings is an essential element to your homebuying process, then we recommend keeping an eye on the pricing trends in the neighborhoods where you’re looking to buy. But where can you find that info? At the bottom of each of our neighborhood pages, you’ll find all of the info we used, and you can keep tabs the housing trends throughout your search.